Authored by Bastien Montagne (mont29) on Jun 18 2014, 1:43 PM. The current version of the code just shifts the problem I tried to fix one level down the hierarchy: Instead of having the -90 degree rotation on the root node it is on the first child. This applies the bake throughout the whole hierarchy. Additionally I made it apply to armatures and bones. In my tests in Unity this produces exactly the result I expected, but I can provide example Blender and Unity scenes and a write up as well. For the non-baked case I didn't see any changes in my tests, but if there are cases where the result is different please reject this patch and I'll find a solution. I decided to provide some more information. I guess I missed the deadline for 2.71... Please don't apply it now until I've added a new option to enable or disable this for people who rely on the 2.71 behaviour. I would never have committed that for 2.71, way too much risky for a last-minute change. And please do not bother about an option here, we already have too much in this exporter, and it would not make much sense (either you want baked transforms, or not). And I still have to find time to test it & understand those changes, some are making me shiver tbh. The problem with fixes like this is always that there are people why rely on the old behaviour, especially if there is some time until the release of 2.72. It would've been almost better to hide the option in the UI so that people don't create content with it until it is working properly. Even the current "bake" should not be an option but the default, but because people have been using it like this for the last few years (and complained about the problems it causes) we can't change it now without breaking a lot of people's existing assets. No, bake will never be default, this is not sane. It is a workaround/helper we offer (afaik, no other app does it? ), it does not even fixes anything, just make them "nicer" in importing app… That’s candy, not real hard feature. As for guys using bugs as features (and there is no bug here, only limitations), well, this is an old issue indeed… Not sure re-introducing buggy behavior just because it turned out to be a feature is a good way to go, better to develop a real feature if it’s really needed (like e.g. the 'save buffer' render option, theorically only used by full OSA, that was abused by compositors as a cache one – we just clearly and cleanly separated both things, so that you get a pure volatile OSA buffer, and real, manageable render cache). But I really doubt current 'bake transform' behavior could be seen as a feature, it’s WIP state really (so yes, maybe hiding it in release would have been wiser… but tip warns about it being highly experimental, iirc). AFAIK the official FBX SDK does it if you use the built-in code to change the up axis. But don't quote me on that, I don't have it installed at the moment. It is not really candy for Unity developers (or game developers in general), where the -90 rotation on root causes all kinds of headaches when it comes to instancing. Without this the bake people will have to export models laying on the side to the get correct orientation when using them for terrain. Other cases are for example people implementing IK or script driven transforms. I'll be happy if it ends up in 2.72, though. I'll try to test this earlier this time so there is a chance to catch and fix problems like this. Ok, so finally took time to check this. All in all, I’m rather happy with the simplification of fbx_object_matrix, I think it makes sense and could not find any potential issue in new 'algo'. breaks here. In fact, I think bake transform should not be applied to bones. We can apply it to meshes, because we can tweak geometry itself (vertex coordinates) to counter-balance the object rotation. Handle bones objects like we do for meshes' geometries. Thank you, I'll look at this right away. By the way, I went through the code to see where (and why) the "local_space" parameter to fbx_object_matrix is used, and it seems to be only used in the old version of the matrix calculation. I'll drop it in the next revision of this patch unless there is a good reason to keep it. I think the math would work out the same way if you treat the armature as a "meshes object", and the bones as "mesh", or if you treat the whole hierarchy as transforms. It worked fine in my test cases, but I'll have to understand more about Blender and this broken scene to see if that is right. Can you just confirm what exact problem you see and in which program? 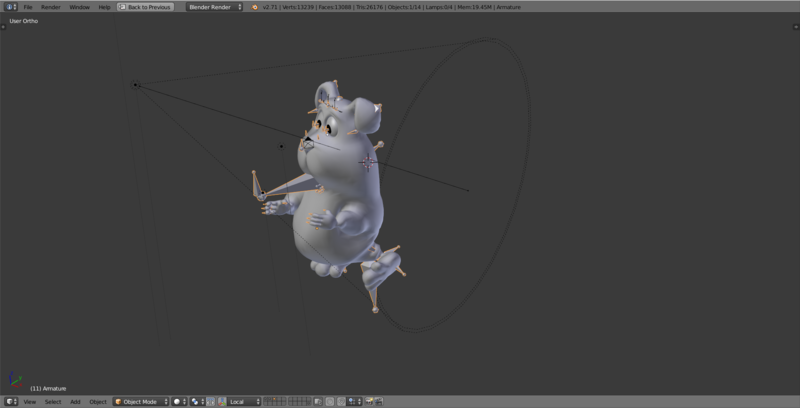 I’m using Blender's FBX importer (from WIP branch). I enlit the biggest (more visible) issues, but many more bones are broken. Treating the whole hierarchy only as transform can't work imho, since you 'remove' needed rotation at one level (object), you have to apply it at another level (geometry for meshes, bones for armature), I can’t see how you would do otherwise. And bone's matrices are a very touchy subject in FBX, since they are used (including in global space) in the skinning data itself… That’s why I did not dare to try to apply 'bake' to armatures/bones, I found it way too hairy for me (but I’m not really at ease with complex matrices handling, tbh). I just got the latest import script from the fbx branch on git, and I was able to reproduce this. It looks like you see the inverse of the problem that Unity people see when they import without bake, but I'll have to check the math in the importer. The version I got from the master branch earlier didn't have skinning import. I'll try to get it fixed by tomorrow. About the bones: You are right, you remove the transform from the children. But child transforms and bones are calculated in world space (in fbx_object_matrix) and then moved into the parent's local space, so it evens out in the end. You are right, though, bones are a touchy subject, not only because of skinning, but because of IK set ups as well. I'll try more test cases before I submit the next patch. After a lot of tests I think you are right about not applying the bake to bones. I don't know if that is because of the bake process or because bones need a similar local transform like lights or cameras, but the end result without the bake looks correct for bones. I did some tests with the official FBX SDK, and unfortunately it doesn't apply the bake. I'd like to do some more tests with Max and Maya, but I don't have access to licenses for them at the moment. I revised the patch a bit with more comments, and changing the naming from "world" to "global" to be more in line with Blender's conventions. I removed the local_space parameter as well because nothing else seemed to use it, and I can't find a sensible reason to keep it. # Meshes parented to armature are handled separately, yet we want the 'no parent' connection (0). This must be considered when calculating an object matrix as well. In my patch I check for MESH child and ARMATURE parent, but it may be better to pass arm_parents to the function to keep both pieces of code in sync. After making the mesh a child of the armature the mesh matrix needs to be relative to the armature matrix. This works, but I'm not sure why you need to back up and restore the object matrix. Do I just attach a new version of the patch? Arf… tested it, and again got odd results… Anyway, I really do not think we should bake if we can't 'counter-bake' at a sub-level (i.e. mesh data, or perhaps bones, but this is over-complex for me). This means, no bake for empties, and no bake currently for armatures (until we can counter-bake at bone level). Anyway, made some changes in WIP branch transform code, including just the 'bake children too' part of your patch for now. I still have to check that 'mesh/armature parenting' issue, do not really understand the issue of hand, but tbh I’m rather sick of FBX for a few days (spent last two days trying to get bone-correction working, was an epic failure :( ). I have no idea if that is part of the FBX "standard" or a convention, but this is how the exporter writes the scene. Now if you import the model without using the armature, for example in the old version of the Blender FBX importer, or in Unity3D with animation disabled, you get a global transform that is just the mesh transform. This was not visible in the new version of the importer because it just made the mesh a child of the armature again without adjusting the matrix, so the bugs cancel each other out. In terms of the FBX exporter, the code that writes out connections changes the scene hierarchy. So fbx_object_matrix has to use the Blender hierarchy when building the global matrix, and it has to use the FBX hierarchy when building the local matrix that is written out. What happens without the bake is that both parent and child get transformed into fbx global space, then the child gets put into the parent's local space. The way it works is that I could apply any silly transform to the parent, but because fbx_object_matrix uses the inverse of the parent to put the child into local space it will still end up in the same global space as before. Or better, in the case of Empties or Armatures, all children of them are transforms themselves, so the bake is applied automatically just by going through fbx_object_matrix. If you can send me some example scenes I can have a look what is causing the problems. I can have a look at your bone adjustment as well if you want to. Mesh/Armature parenting issue: Ok, makes sense indeed! Never hit this one since I did not import without armature (and also probably since most models I tried were on 'NULL' transform). Will add this to Master/WIP asap. It was also in this file I noticed some issues with bones, irrc - but tbh I'd need to recheck that. For the records, committed fix for rigged meshes issue as rBA905f58de. Thanks again for noting that issue. Jens Restemeier (jrestemeier) edited edge metadata. This patch is really the most stripped down code that does the job for most people, without becoming too complicated to maintain or too slow. Note that I’m not opposed to applying bake to empties (in fact, in that case, it does not have much importance), but applying it to data like armatures, cameras, etc. really seems hairy to me, we up till now never managed to get that working. I think I’m going to keep current code for now, afaik it works in all cases, and just add empty in 'bake'-enabled obj types. I fixed it so many times, both in the old Ascii exporter and in this. I'm kind-of fed up with working on proper fixes for this, testing it for ages, and then a few commits down the line some unrelated change will have broken it again. That's why I submitted this change that works for most use cases without being hard to maintain. 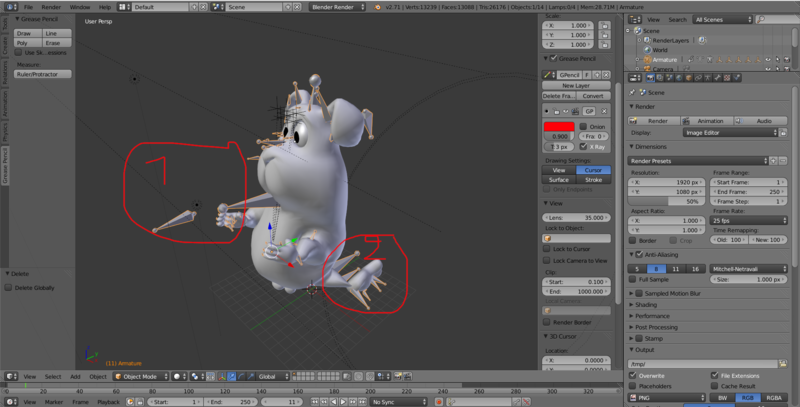 By the way, I noticed that children to bones in Blender are not attached to the bone node in FBX. It is nothing I need to have fixed, though. Bastien Montagne (mont29) edited reviewers, added: Jens Restemeier (jrestemeier); removed: Bastien Montagne (mont29).